Reference up-to-date medical gas and vacuum systems rules plus expert guidance you can trust in the 2018 edition NFPA 99 and Medical Gas and Vacuum Systems Handbook Set! 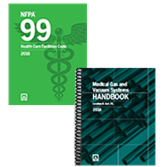 Be ready to work safely, efficiently, and confidently on any health care facility job with the combined power of the 2018 edition NFPA 99: Health Care Facilities Code and the unique, Medical Gas and Vacuum Systems Handbook. Stay up-to-code to ensure systems are ready to save lives, and don't endanger patients and staff in the health care environment.